Black spot on rose leaves. Rose species. Common on hybrid teas, grandifloras, and miniature types. On rose, black spots with fringed margins appear on either leaf surface but predominantly the upper surface of leaves. Infected leaves turn yellow, except for the black spots, and drop from the plant. Similar symptoms occur on petioles and fruit. Flower petals develop red spots and some distortion. Canes may become infected during the first year of development. Lesions are purplish red, then black, and slightly raised. 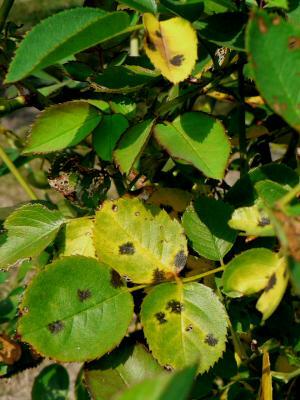 Black spot causes plant disfigurement and weak growth, predisposing the plant to other infectious and noninfectious problems. The fungus (Diplocarpon rosae) overwinters on rose canes and fallen leaves. Primary infection occurs when spores are splashed to new leaves in the spring. Many secondary cycles follow, with a peak in late summer. Environmental conditions that promote infection are wet leaf surfaces, high humidity, and warm temperatures. Resistance to this disease is available in various rose cultivars. Varies from highly susceptible to highly resistant. In large rose plantings where susceptible varieties must be grown, it helps to plant a mix of susceptible and resistant cultivars. Measures to increase air flow reduce disease severity by promoting rapid drying of foliage. Because the fungus survives in fallen leaves and infected canes, these must be removed in the fall or before bud-break the following spring. Fungicides can be used to control this disease but multiple, preventive applications are required, beginning as new leaves appear, and repeating well into the fall on highly susceptible varieties. Lengthen spray intervals or skip sprays altogether during dry weather.